Shirley Hayes was involved in the efforts to keep Washington Square Park closed to traffic. Organizations: Joint Emergency Committee to Close Washington Square Park to Traffic, National Organization for Women, Save the Square! Shirley Hayes was born Shirley Zac in Chicago on June 15, 1912. After attending the University of Wisconsin, she studied painting and acting in Chicago before moving to New York in 1932 to pursue an acting career. Hayes and her husband, James, had four sons—Christopher, Kerry, Timothy, and Dennis—before their marriage ended in divorce in 1965. Hayes’ sons became minor celebrities in their mother’s quest to preserve Washington Square Park: in some early demonstrations, Hayes brought her stroller-riding sons to demonstrate the popularity of the park with children. A charter member of the National Organization for Women (NOW), Hayes campaigned for and worked with New York City Mayor John V. Lindsay during his administration. 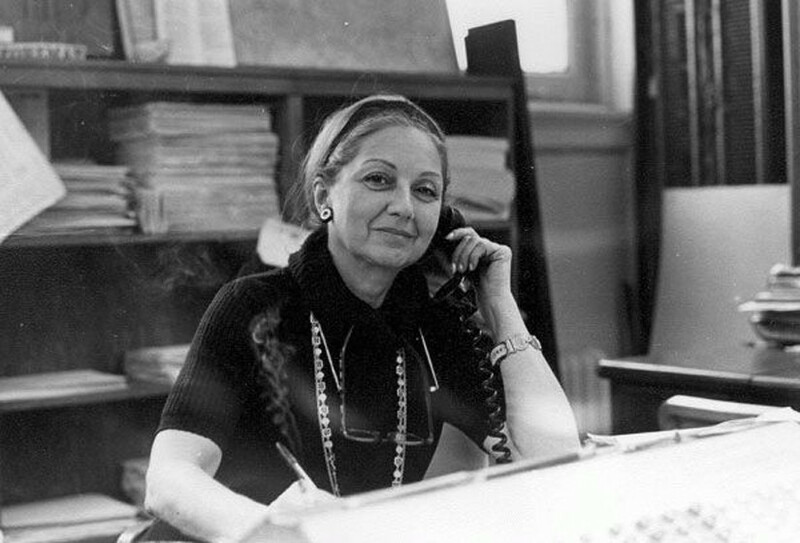 After her divorce, Hayes worked on radio station WNYC’s “While the City Sleeps” and other programs, and was honored by the Parks Department of New York City with a commemorative plaque in Washington Square Park in 2001.1 Hayes passed away May 6, 2002. Hayes initiated "Save the Square! ", a seven-year battle to keep automobiles out of the park, thus shifting the public debate over the size of the road through the park to the existence of the road at all. Though several different options for a roadway in the park were explored, including sinking the road, Hayes and her supporters sought a result that would "best serve the needs of children and adults of this family community" Hayes in turn presented her own proposal: 1.75 acres of roadway would be converted to parkland, a paved area would be created for emergency access only, and all other vehicles would be permanently banned from the park. Hayes was joined in her efforts by Ray Rubinow’s Joint Emergency Committee to Close Washington Square Park to Traffic, which, backed by planner Stanley Tankel’s study, proposed in 1958 that the City shut out cars for a six-month trial period. After a public hearing, a "ribbon tying" ceremony was held to mark the inception of the period in which the park would be free of vehicular traffic. The plan to close the park to traffic received widespread support from Village dwellers, including one-time Washington Square Park West resident Eleanor Roosevelt, and politicians like Congressman (and later, Mayor) John Lindsay. As the result of a quid pro quo political arrangement, Tammany Hall leader Carmine DeSapio also endorsed the plan to close the park to traffic, proving to be the step needed for its approval in 1959 by the Board of Estimate. In August 1959, the efforts of Hayes and her allies paid off: Washington Square Park was closed to traffic forever. Hayes’s campaign to get traffic out of Washington Square was a cause célèbre in the growing opposition to Robert Moses’s broad swath planning and the fuel for popular support for the nascent preservation movement. A plaque commemorating Shirley Hayes’s tireless crusade can be seen in Washington Square Park today. Shirley Hayes’s collection of papers is located at the New-York Historical Society. The papers, which comprise approximately 9.03 linear feet, cover her Greenwich Village activism from 1948-2001, though the bulk of material dates from 1952-1979. The collection encompasses a variety of data and includes correspondence, photos, petitions, speeches, and audio and video recordings. Series I-V cover Washington Square Park, Greenwich Village, and Community Planning Board #2; Series XI–XIV cover Articles/Clippings, Visual Materials, Recordings, and Notes. Access to the Shirley Hayes Papers is open to qualified researchers only, and permission to quote from the collection in a publication must be requested and granted in writing. A finding aid, created by Tiffany Schureman, is available at the New-York Historical Society. Contact the Manuscript Department for more information. Douglas Martin, “Shirley Hayes, 89; Won Victory Over a Road,” The New York Times, 11 May 2002, Section A, National edition. Sanka Knox, “Villagers Defeat New Traffic Plan,” The New York Times, 28 May 1952, page 31.